Constrained and steep site, high fire zone, great likelihood of boulders tumbling down hillside at edges of site, juxtaposed with the client’s desire for maximizing views and openness to outdoor spaces. 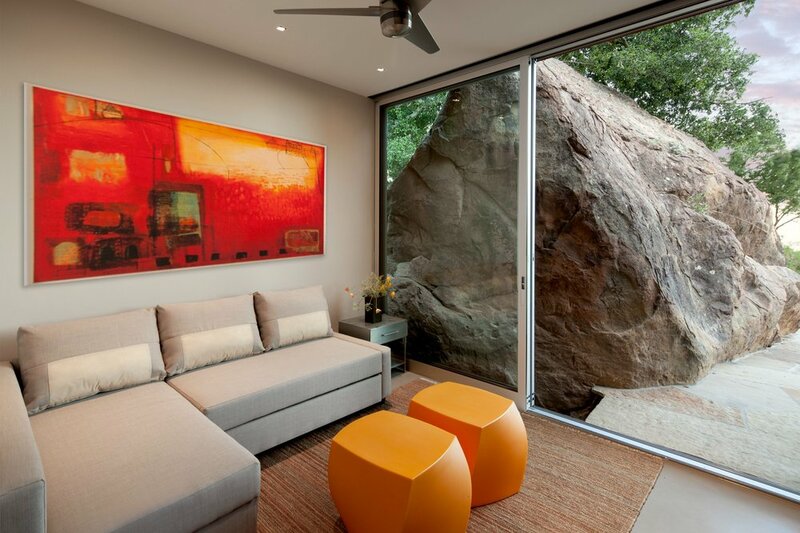 open glass walls for indoor-outdoor living. The Mountain Drive Cabana, an 800 sf wildfire rebuild, is remarkably sited between several enormous boulders. The property is studded with mature live oaks and California native plants on the steep hillsides. The contemporary design riffs off the main house which has thick walls running through the building. The cabana pushes those to the outside with massive protective concrete walls to the east and west. These function as thermal mass and protection should additional boulders tumble down. Full height sliding glass panels provide views of the ocean and access to the pool area to the south, and to the north connect to hillside gardens and expansive mountain views. Integral-colored stucco continues on both sides of the glass walls, blurring the visual transition between the cabana interior and the outdoor deck. Earth tones emerge from the ground while the white ceiling plane reflects late afternoon sun below the deep south-facing overhang. Corten steel materially links the structure to the renovated pool deck and walls below. The thick walls provide opportunities for closets, bookshelves, fireplace, reading nook, and kitchen counters. Details emphasize simplicity - reglets transition wall to ceiling planes, all openings and doors are full-height, jambs are concealed, creating smooth corners with no trim. At the Corten fascia, an integrated gutter passes through the wall into a hanging anchor-chain, eliminating downspouts and reflecting the owners’ love of the sea. Solar panels on the roof generate electricity and warm the pool water. 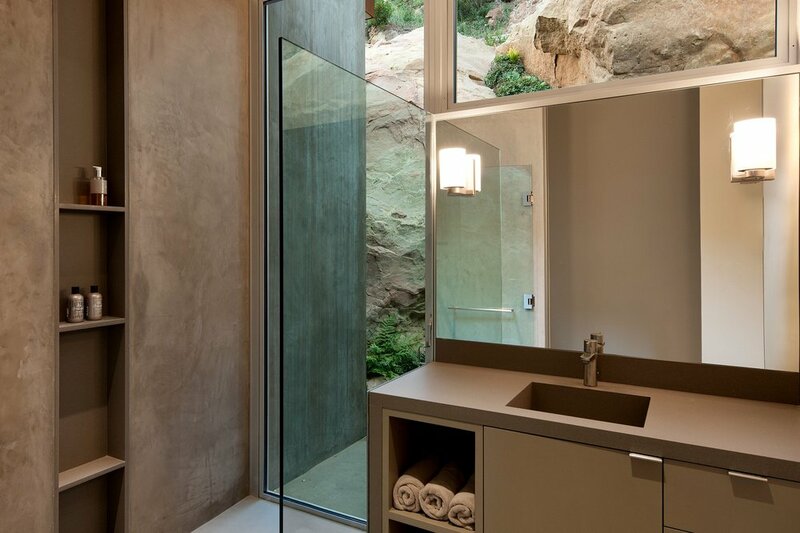 The design transforms what was once a mountainside shelter into a sustainable oasis with extraordinary views from the craggy peaks to the vast ocean - pure California.